Naoto and I loved experiencing Japanese coffee culture during our last trip to Japan and now, we can enjoy a bit of it here in Chicago! 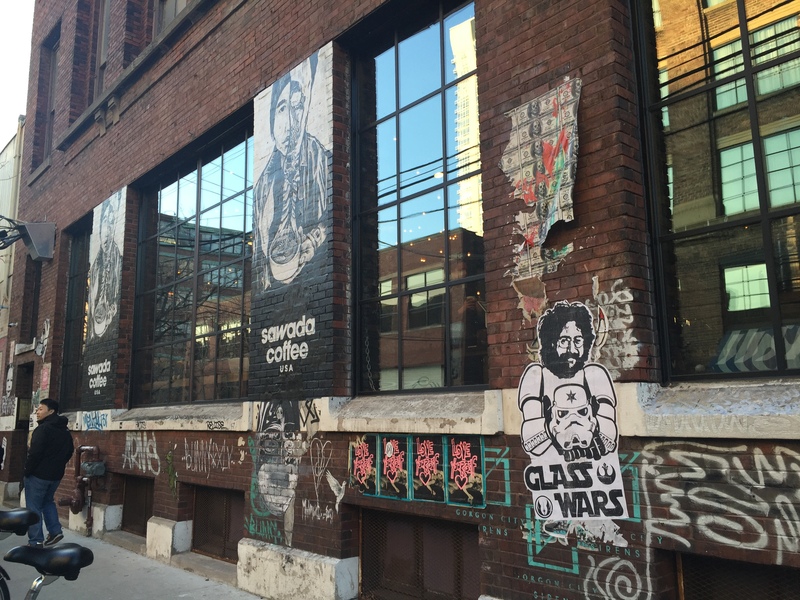 Sawada Coffee opened in the West Loop and we went to try it out a few weekends ago. 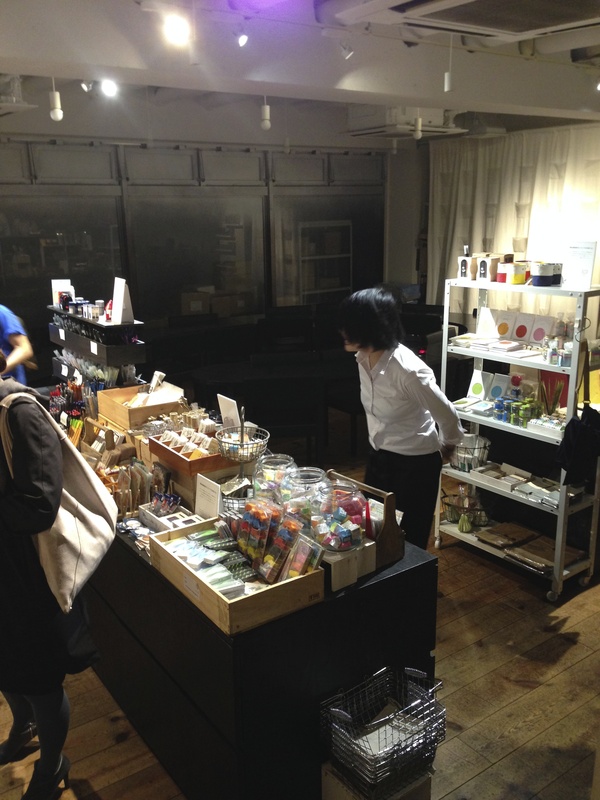 Hiroshi Sawada is an award-winning Japanese barista and latte artist who owns a shop, Steamer Coffee Co, in Tokyo. 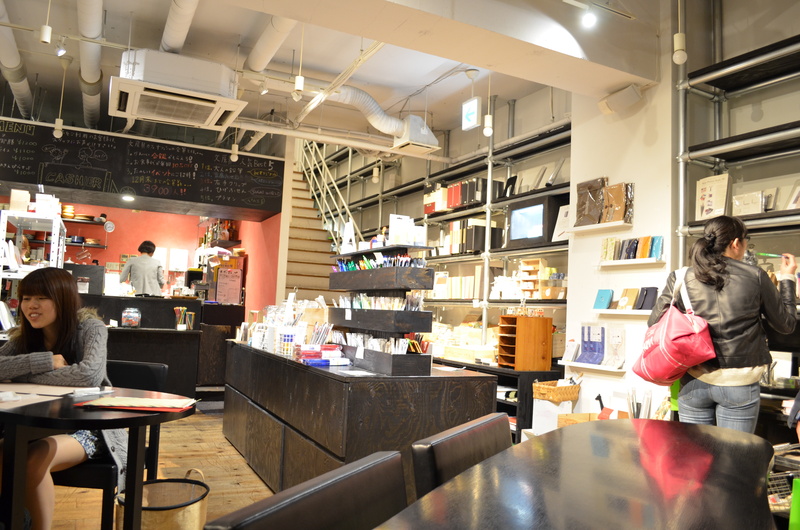 This is Sawada’s first coffee shop outside of Japan. (You can read a little bit about it here. The relationship between Sawada and the Chicago hospitality group who opened the shop in Chicago started with letter writing!) 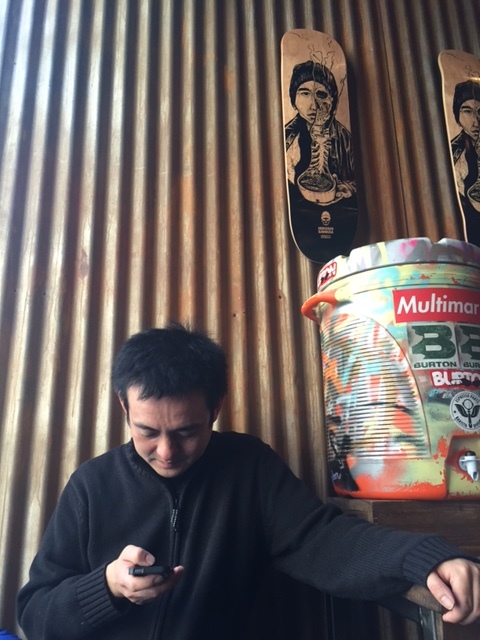 The place feels very “hipster,” but there are some very Japanese aspects, too. 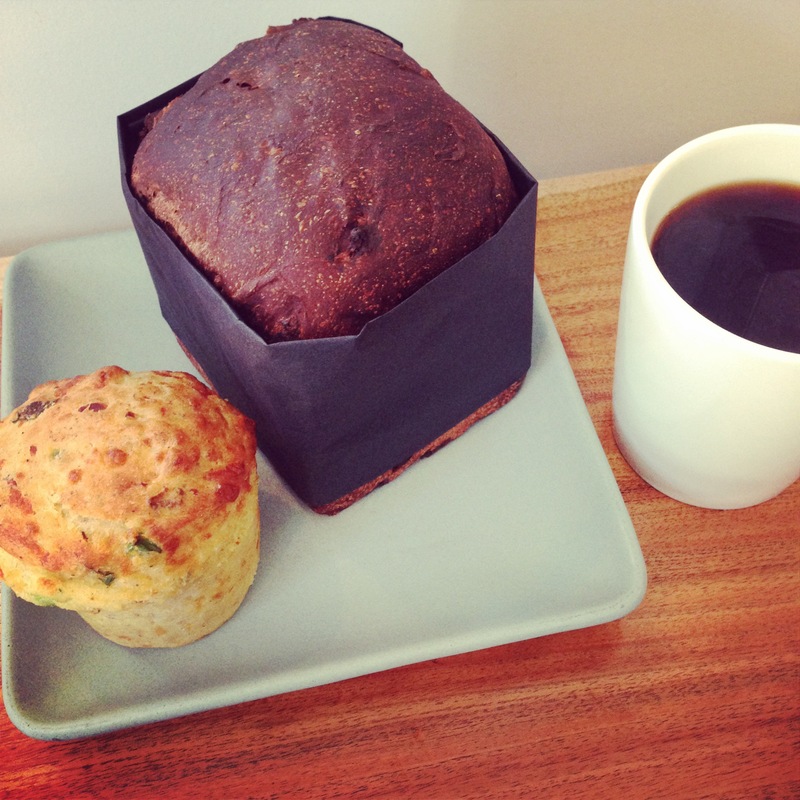 The coffee presentation is lovely, the service is impeccable, and the atmosphere is very industrial and modern. The coffee shop is connected to Green Street Meats, so there’s a lot of restaurant and bar action just steps below the coffee shop in this big open space. 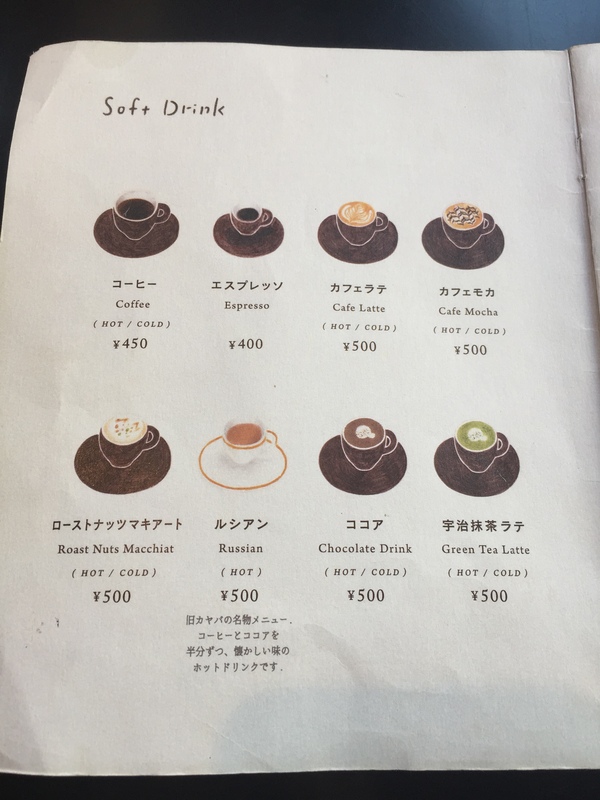 Sawada serves the typical range of coffee drinks, but also has some one-of-a-kind offerings, including alcoholic coffee and tea drinks. 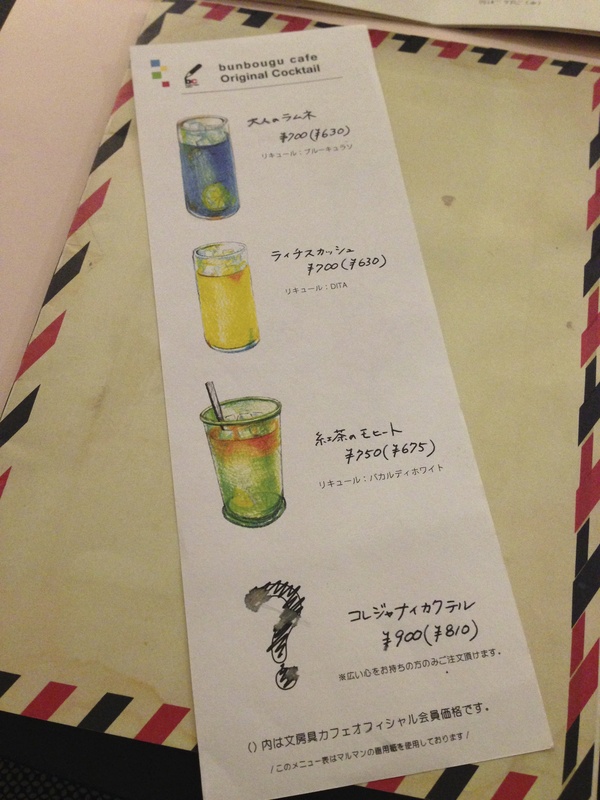 Naoto ordered the Sawada Style Cold Brew, an iced coffee mixed with Japanese shochu. It came in a pot and was poured into a glass sitting in a box, similar to the way sake is sometimes served in Japan. (I was stifling a tiny laugh as our server earnestly explained the sake overflow tradition to Naoto.) 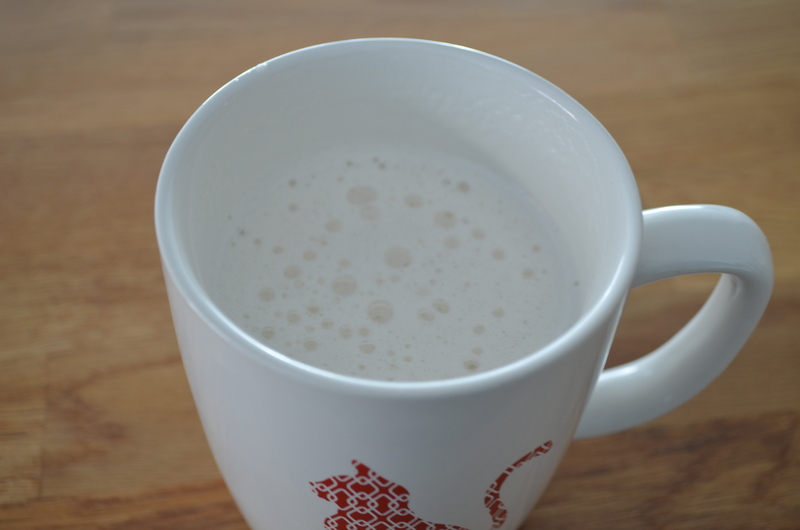 I had a Benedictine Chai Steamer, a chai latte with Benedictine liqueur added. Both were amazing. We found a seat at the windows, in spite of the place being crazy busy. Naoto stood and texted while I wrote out a few Sawada postcards. 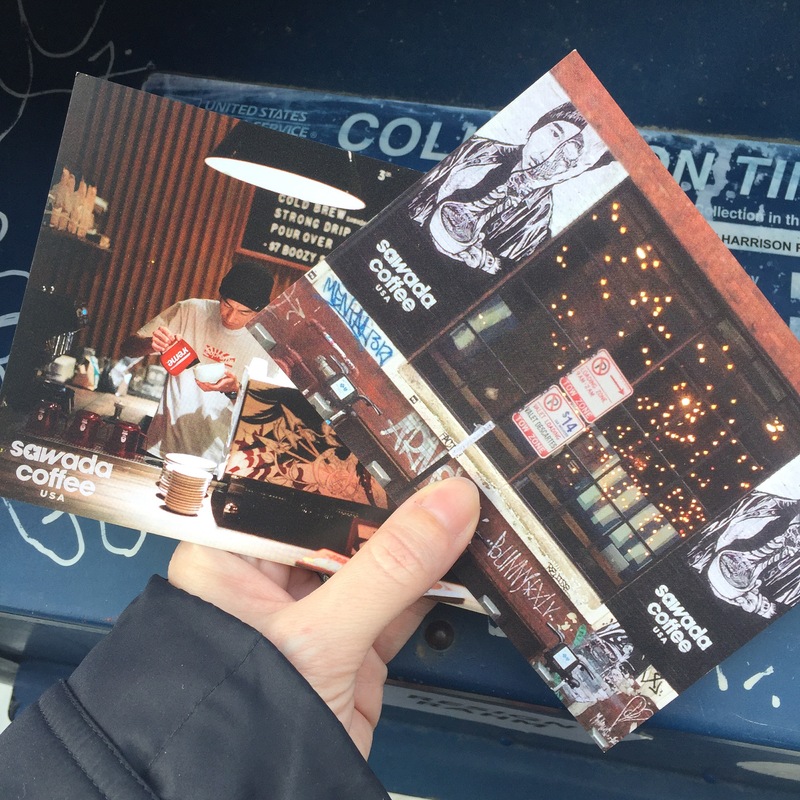 (I love places that have free postcards!) 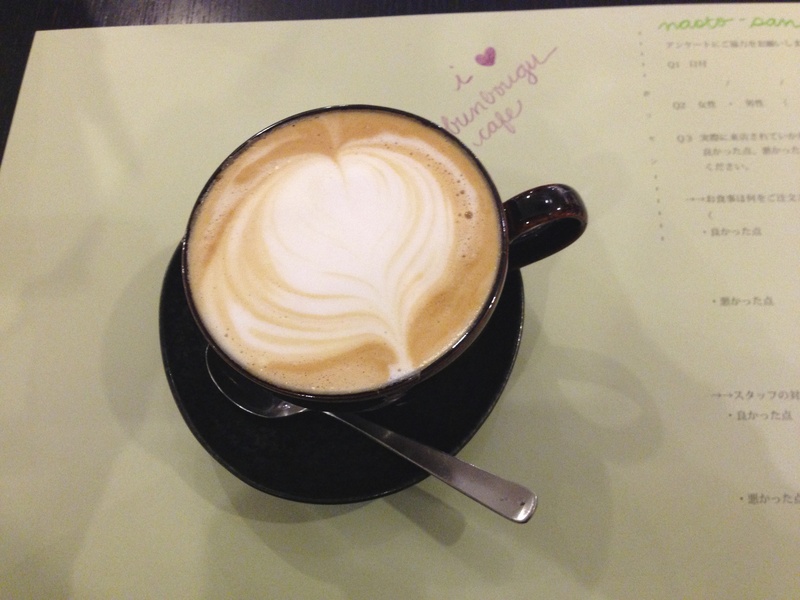 I couldn’t resist trying a matcha latte, too…it was the perfect mix of strong matcha with a tiny bit of sweetness. 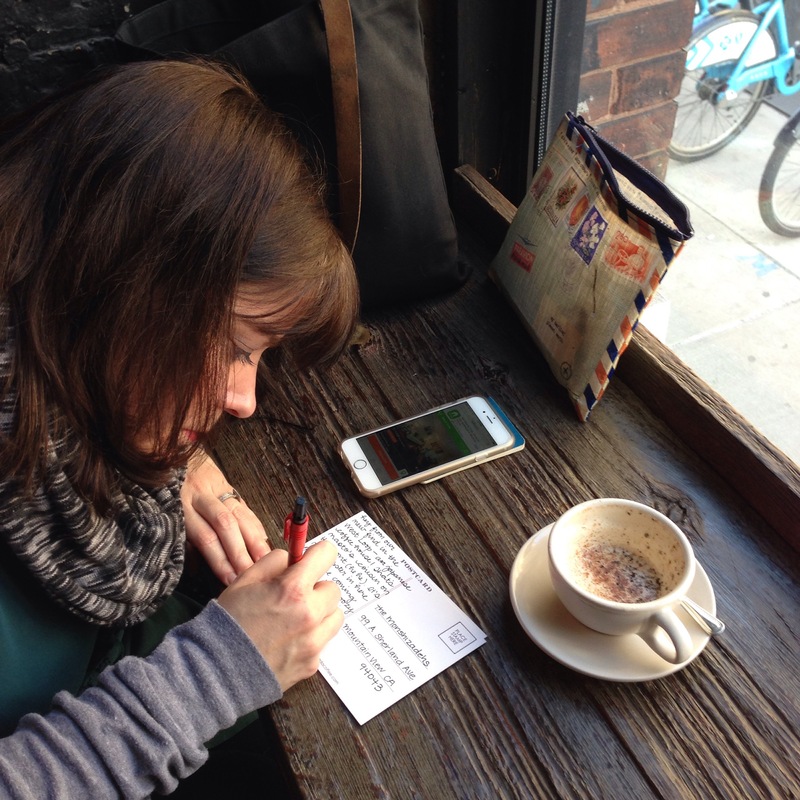 We can’t wait to go back again soon…for the coffee and the postcards. 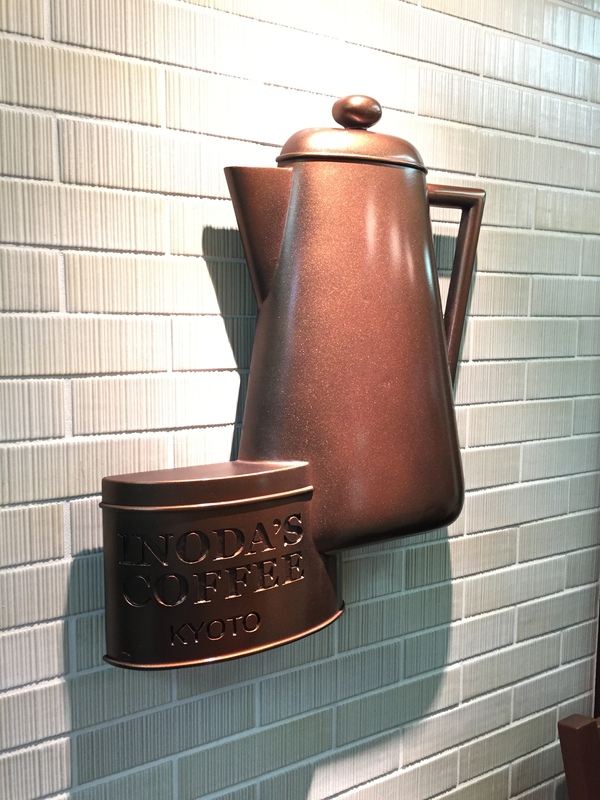 Inoda Coffee is another classic coffee shop in Japan. 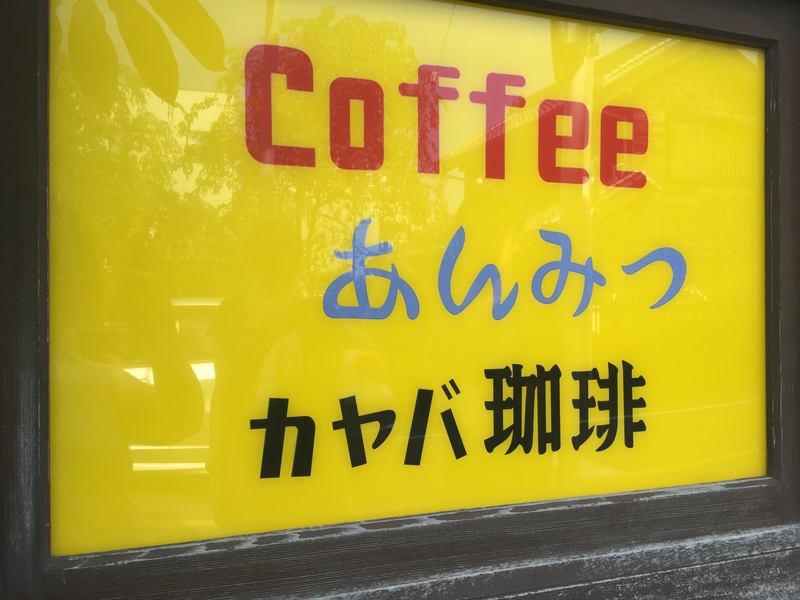 My sister-in-law, Hisae, took us there and then Naoto and I stopped in later for a quick cup of coffee and a snack after a long day of craft shopping. 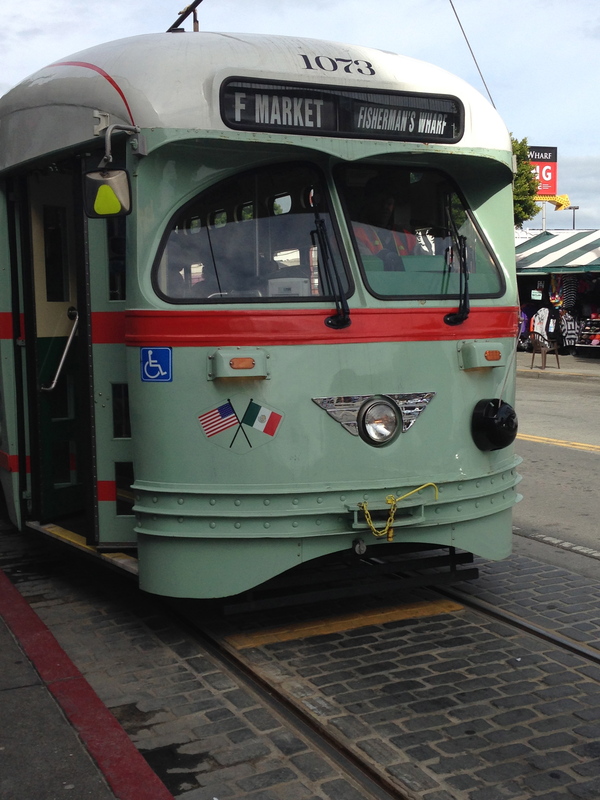 Inoda has been around since the 1940s and when you visit, it feels like not much has changed since then. The shops feel very old-school and luxurious with comfy leather chairs, classic china, and impeccable service. The servers have omotenashi (Japanese hospitality) perfected with their polite, efficient service. There are no frappes, macchiatos, or mochas here. 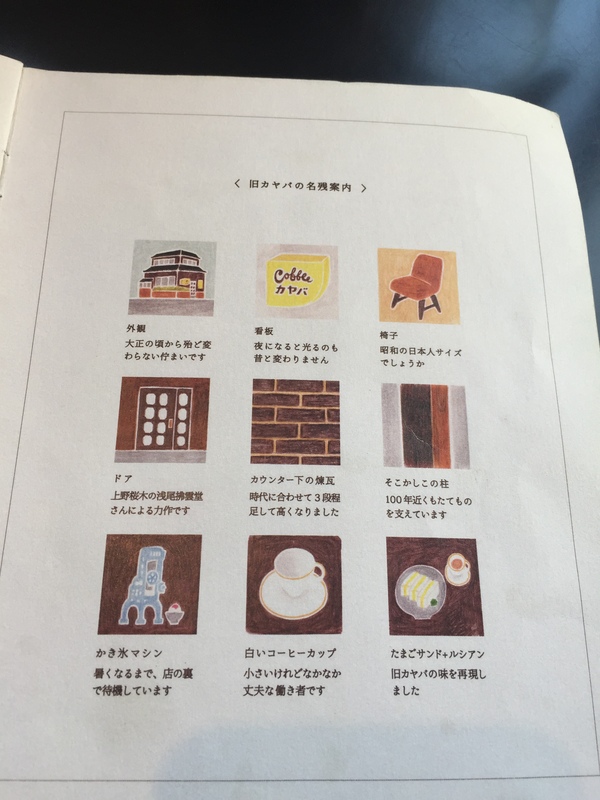 Though they do offer a latte and “coffee with ice cream”, most of the menu is devoted to different varieties of plain ol’ (but very delicious and strong!) coffee. Apparently, they will prepare your coffee with the perfect amount of cream and sugar. Back in the day the owner noticed that customers were lingering over their coffees, thinking or chatting with friends, and letting their coffee get cold before they had a chance to add the cream and sugar. Then the cream and sugar wouldn’t blend properly, making the coffee less enjoyable. 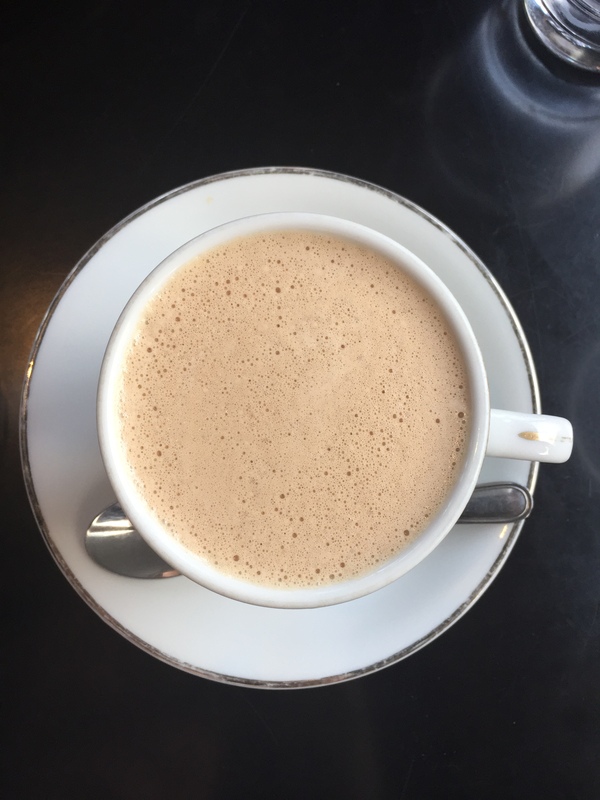 So he decided that the staff should add the cream and sugar so the coffee could be enjoyed immediately without interrupting the customers’ thoughts and conversation. There are several branches of Inoda all over Kyoto and we visited two of them, but not the “honten” (main branch). Next time! On our last full day in Tokyo we decided to explore Sangenjaya, the neighborhood where we stay each time we visit. We are ashamed to say that we’ve missed out on SO MUCH good stuff! Next time, I’m going to have to remember that there’s more to Sangenjaya than Mister Donut and our hotel street! For the rest of the week, I’ll be sharing some gems from the neighborhood. 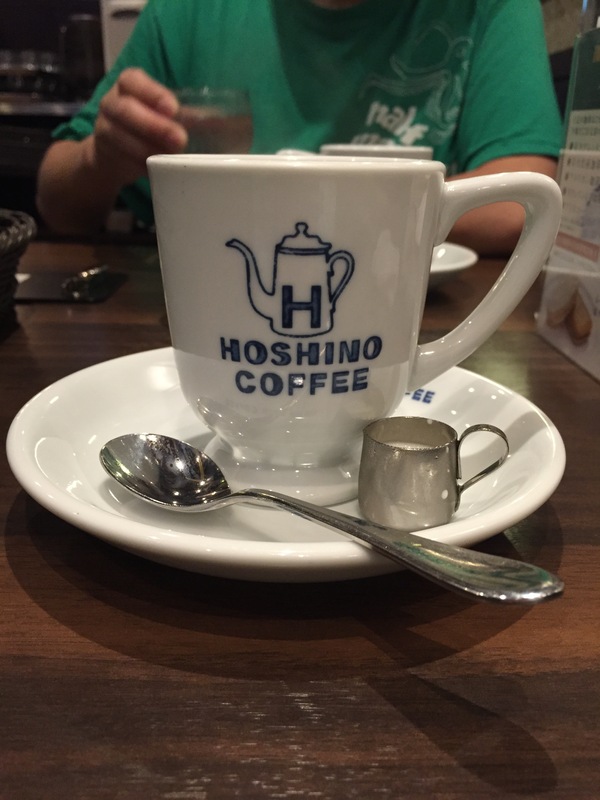 Hoshino Coffee was one of our final hour discoveries. 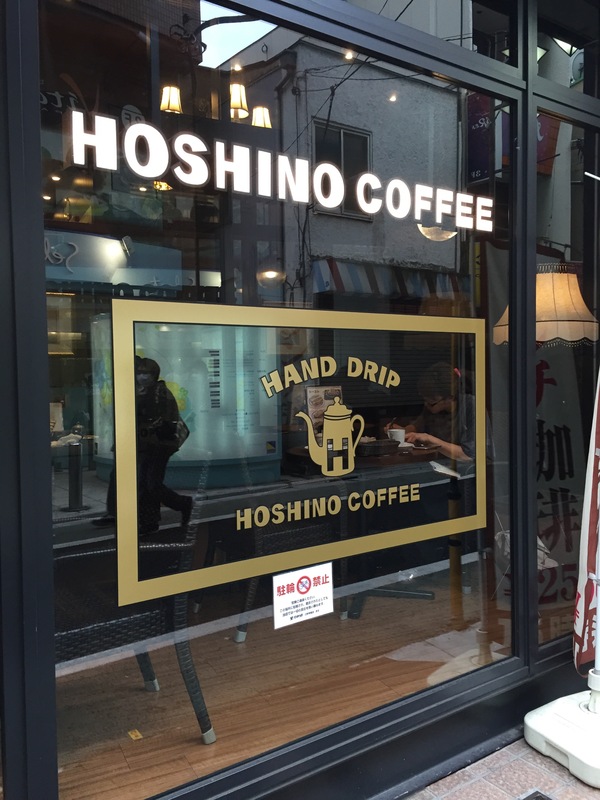 You can find Hoshino shops all over Japan (and even in Singapore). 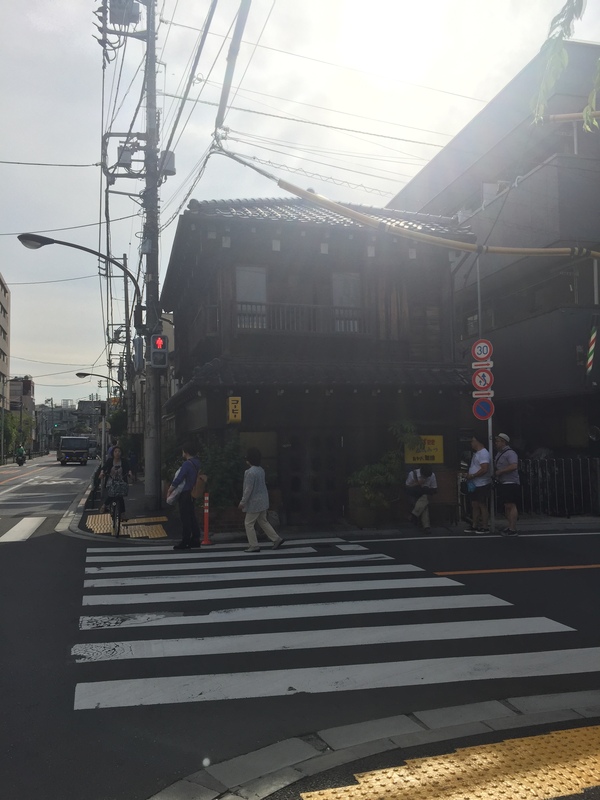 The Hoshino in Sangenjaya happened to be just three blocks away from our hotel. They are famous for their hand-poured coffees and their soufflé pancakes. 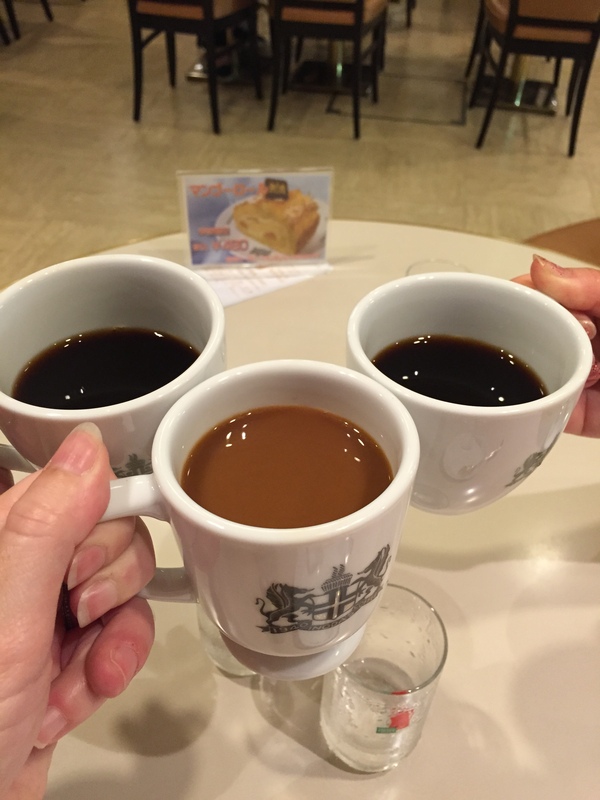 I had the Charcoal Roast Coffee. It was STRONG, but really delicious. 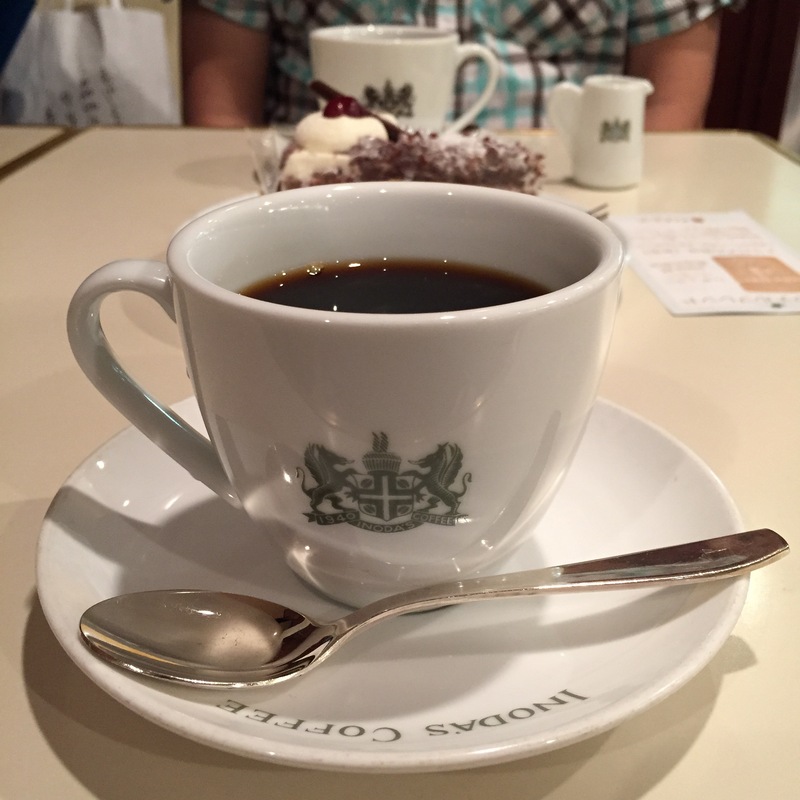 (It seems like all of the fancy coffee in Japan is strong.) 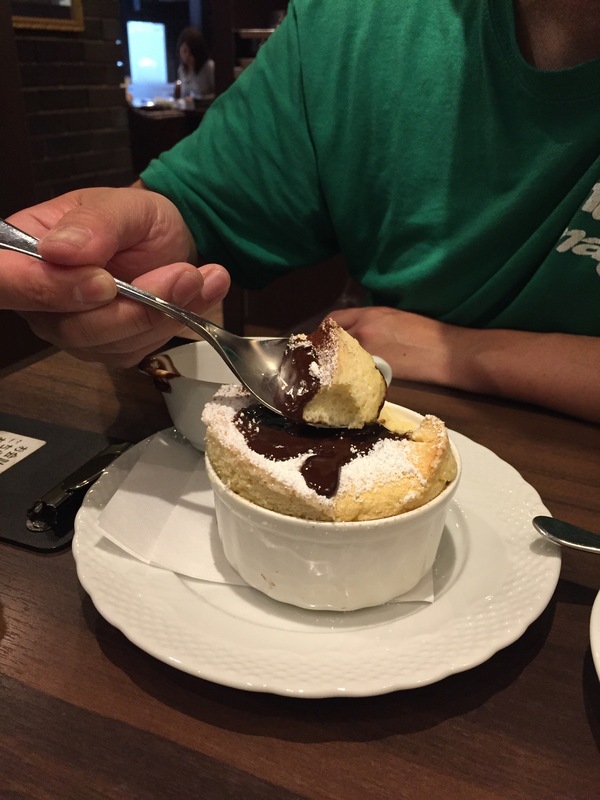 Naoto ordered a soufflé. To say it was heaven in a ramekin is an understatement. I’ve never tasted something so light and sweet and buttery. 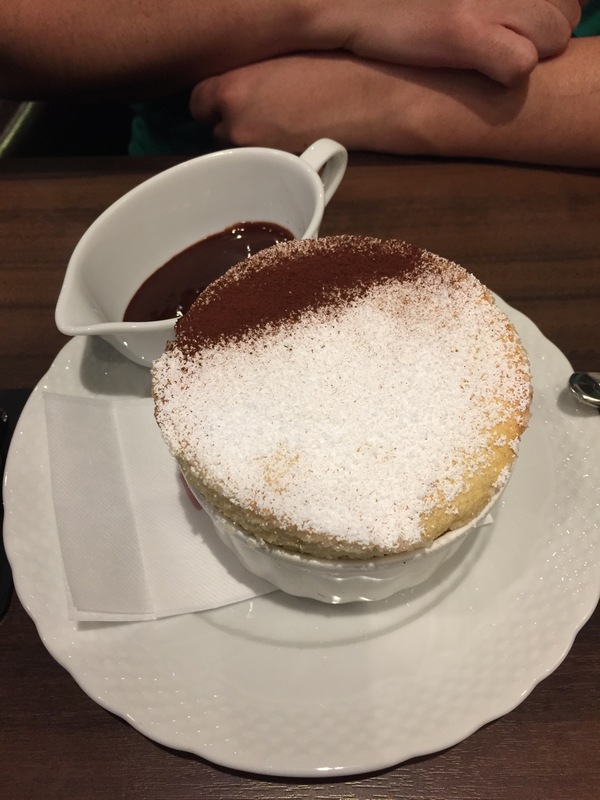 The thick chocolate syrup was rich and just bitter enough to balance the sweetness of the soufflé. The trouble with Japan is that there are just too many good things to eat! Before we enjoyed Hasegawa Happy Hour at the Suzukis, we spent the day together shopping in Asakusa and having lunch and coffee in the Taito Ward of Tokyo. 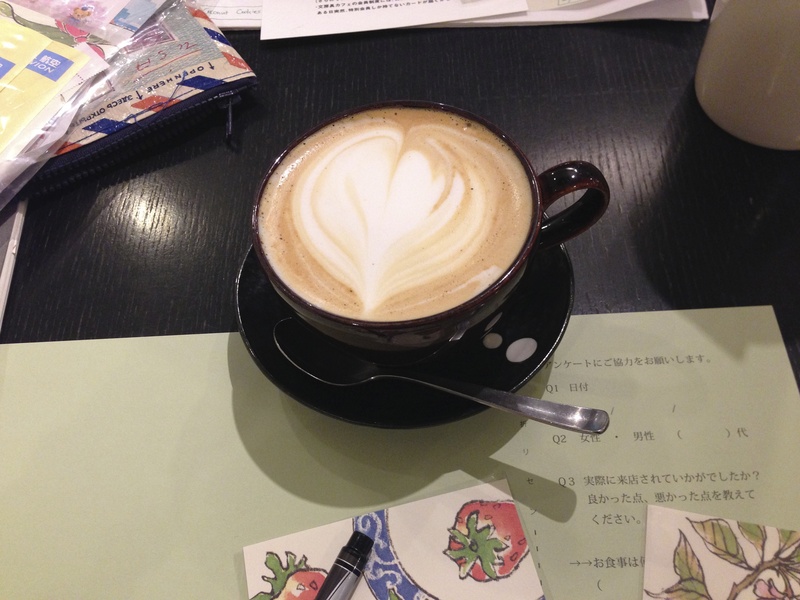 We went to this charming old coffee shop called Kayaba Coffee. The building that holds Kayaba was built in 1917 as a house. 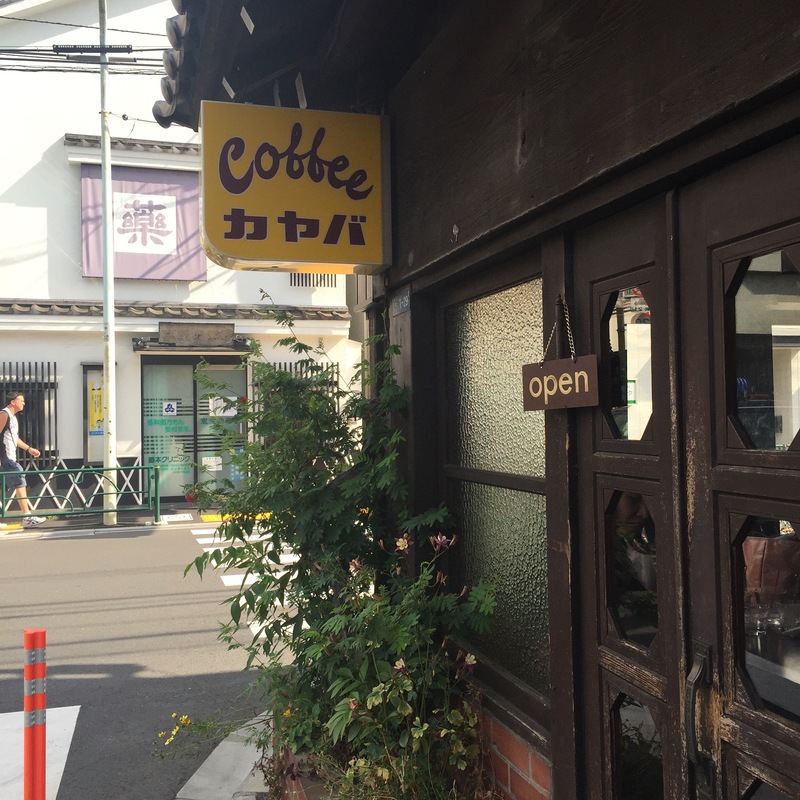 In 1938 the Kayaba family turned the house into a coffee shop that Mrs. Kayaba and her daughter Sachiko ran for almost 70 years until Sachiko died in 2006. 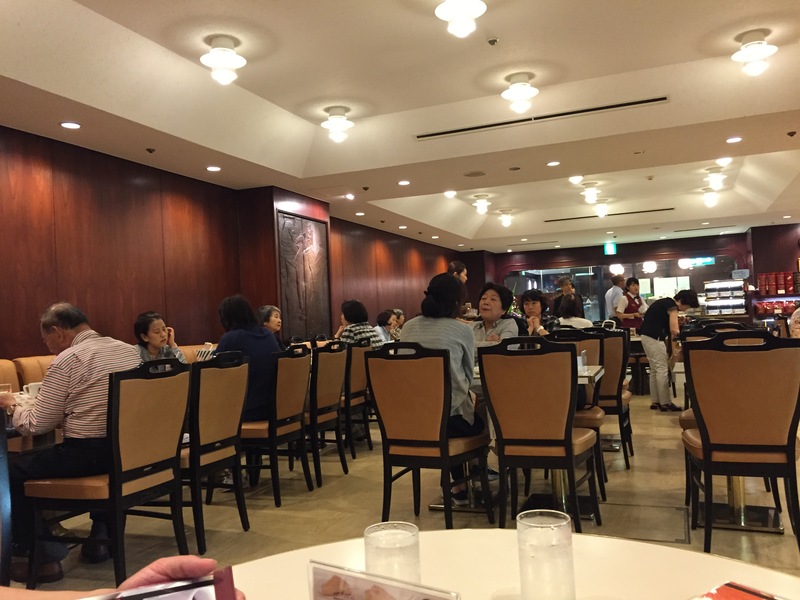 When Sachiko died, Kayaba closed until 2009 when it was renovated and reopened. The outside of the building has remained the same since 1917 and much of the inside–the ambiance, chairs, signage, and china–are true to the past. The chairs are super-short, designed for Japanese people in the 1930s, but they were surprisingly comfortable. (Of course, I’m short, so…) The menu is filled with drawings of the key historical points of the Kayaba building and history, and of the drink and food choices. They offer a huge variety of hot and cold drinks and food. (The egg salad sandwich is crafted to emulate the original recipe. I want to try it the next time we go!) 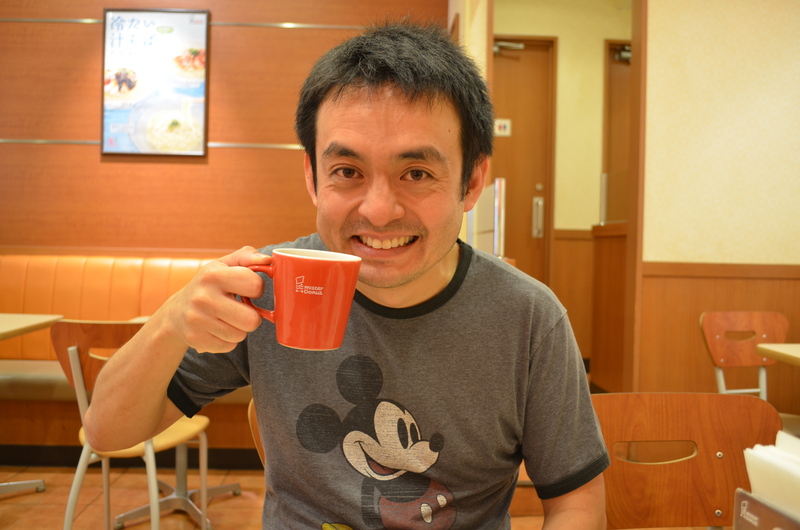 Naoto had a Russian, a classic Kayaba drink made from half hot chocolate and half coffee. It was rich and delicious. 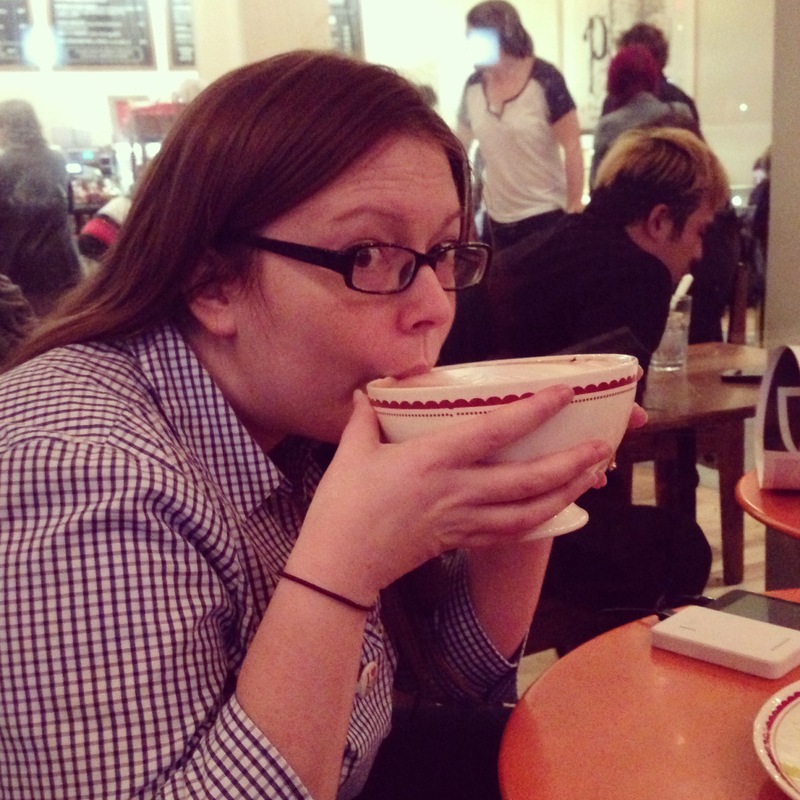 I had a matcha latte and it was life-changing. The matcha, the foam, and the subtle sweetness were all perfection. And, it was stunning. 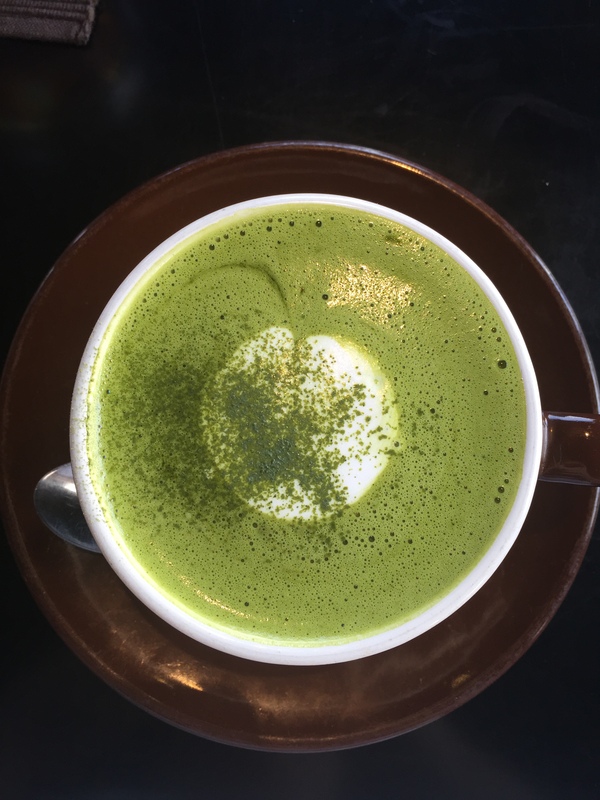 America, we need to up our matcha latte game! Oh Bunbougu Cafe! Please expand to my community! I know, I know…it wouldn’t be the same. 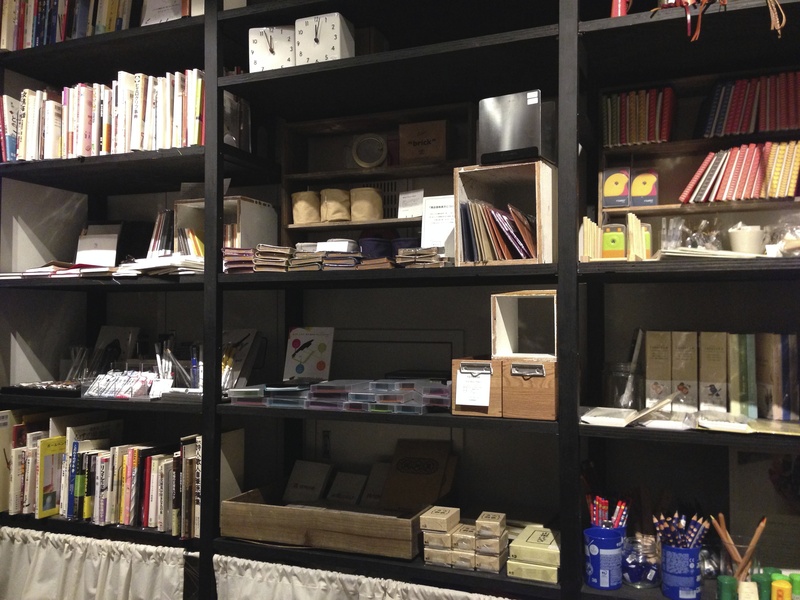 I wish more people in the US would embrace the marriage of cafes and stationery shops. I spent a lot of time at Bunbougu during our vacation. In addition to spending my birthday there, we went back again and again for coffees and shopping. My favorite thing (other than my birthday dinner) was the snack you see above. I ordered a set that included a pot of tea and three tiny sweets. 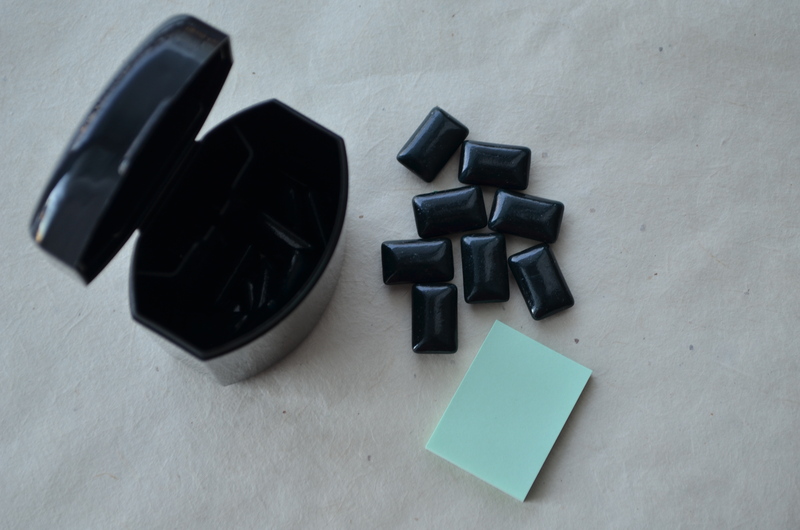 As you can imagine, I was blown away by the tiny office supply-shaped cookies. 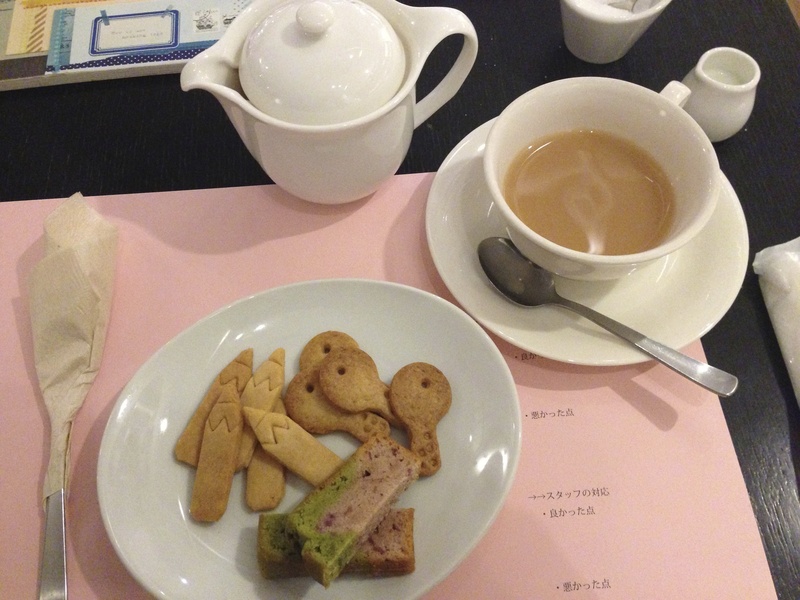 I ordered the strawberry matcha poundcake, the hazelnut ginger pencil cookies and the yuzu pepper key cookies. Everything was so flavorful and delicious–the keys were so peppery that my mouth was burning (in the best way possible!) There were other options on the menu (including a coconut flavored triangle and protractor) and you can see them here. 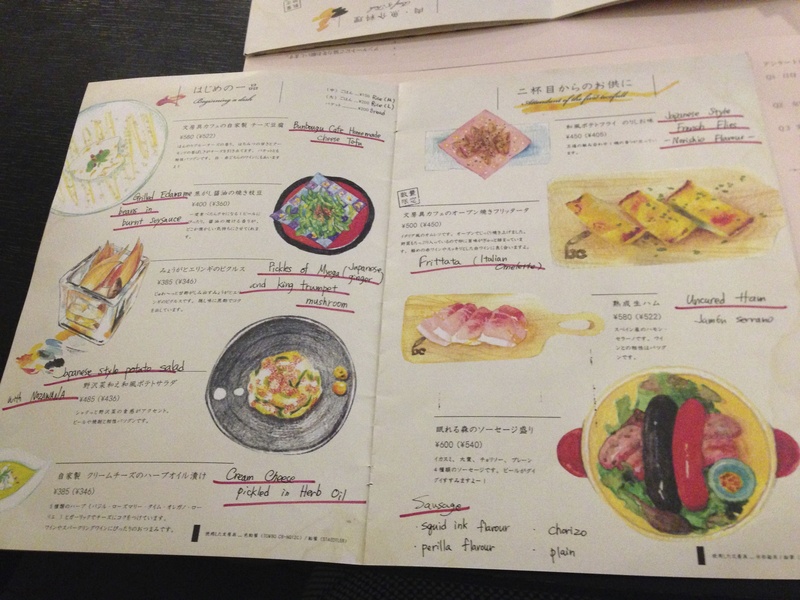 All of Bunbougu Cafe’s menus are hand drawn (by one of their own workers) with gorgeous colored pencil illustrations of their food and cocktails. 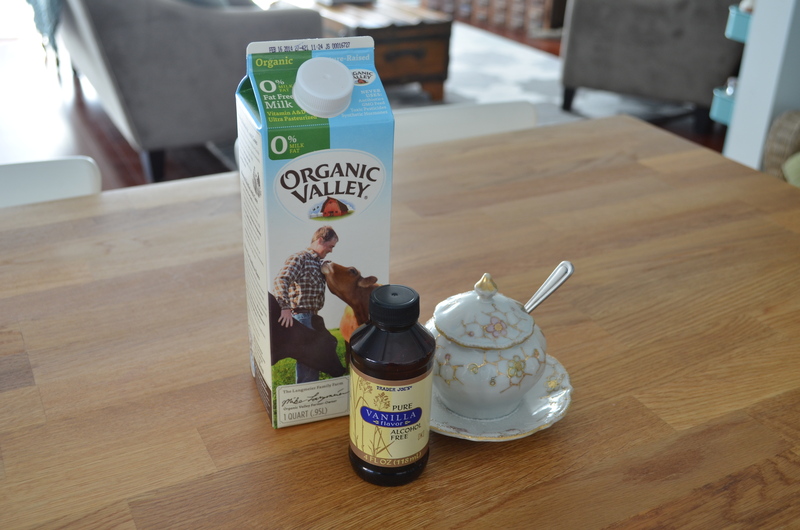 One of my favorite things to order was the caramel tea latte, a milky black tea with a hint of caramel-y sweetness. I’m working on perfecting my own at home since it will be awhile before I can drink one at Bunbougu again! If you received a postcard from me in Japan, most likely it was written at Misdo or Bunbougu…it’s the perfect place for mail! Bunbougu offers loads of unique stationery, desk items, pens and pencils, washi tape, office supplies… Many things are made in Japan and most of their offerings are from small makers and businesses. I saw many familiar American makers’ products too. I ended up buying two more silver boxes, pencils and washi tape. But my favorite “purchase” was my new membership at the Bunbougu Cafe. 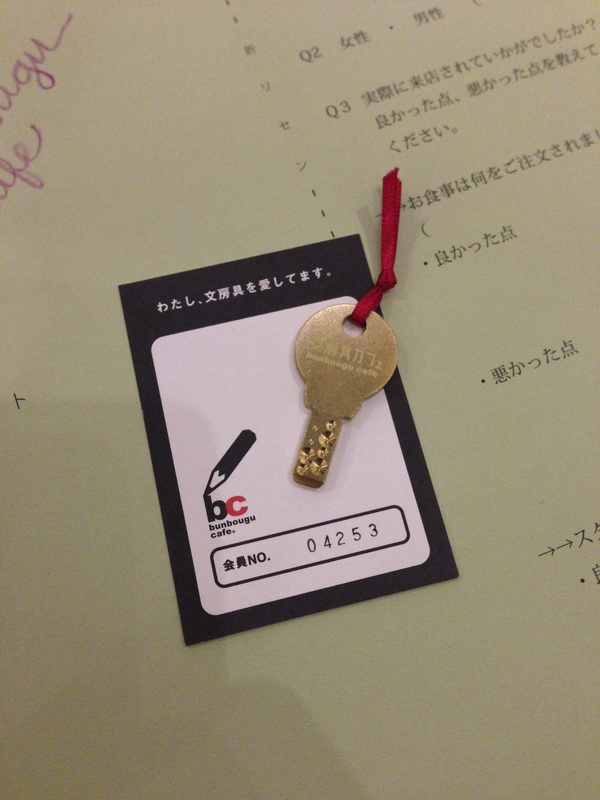 For ¥700, I now have my own membership card and a key to the stationery drawers at Bunbougu! Now each time I go, I can show off my key or my membership card and get into special events (if they ever occur during our visits) and unlock the stationery drawers at the cafe. 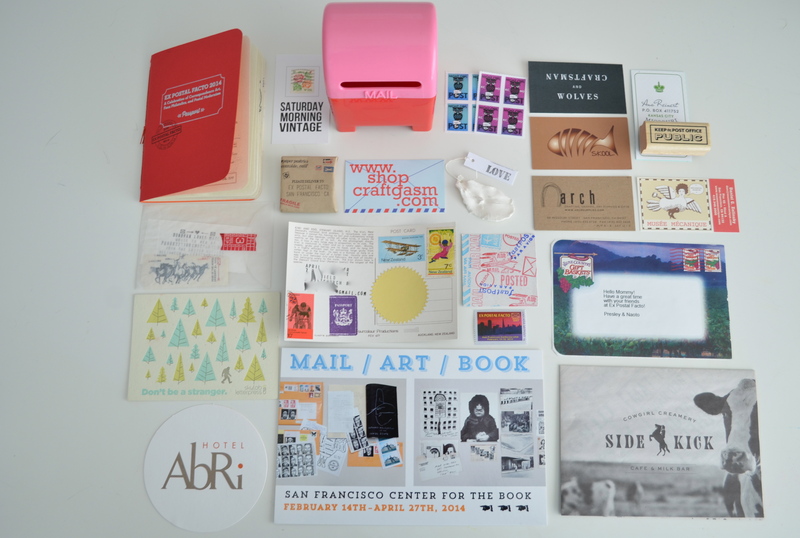 I already left my business card in one and sifted through the pretty papers and pens…apparently too busy enjoying things to take a picture (sorry!) See you soon, Bunbougu Cafe! 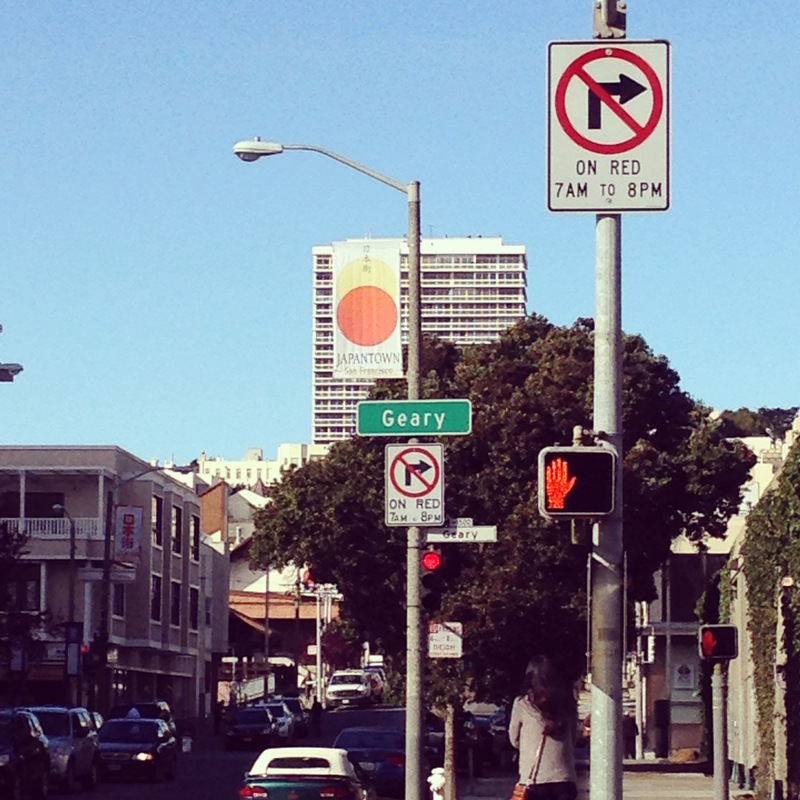 As a final post about San Francisco and Ex Postal Facto, I thought I’d share a few favorites from my trip. 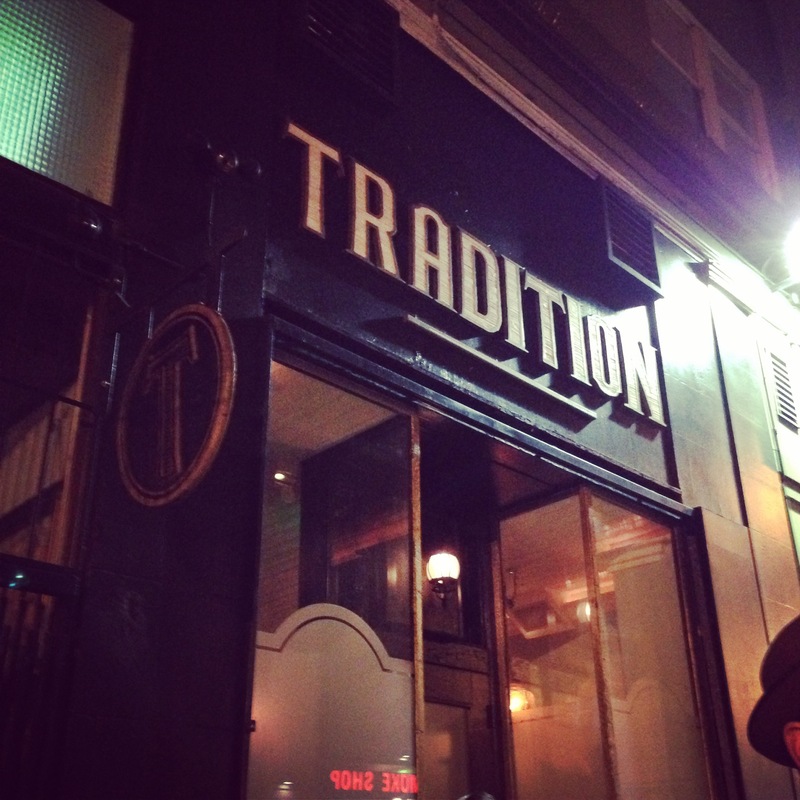 I stayed at the Hotel Abri near Union Square. Naoto and I chose it blindly because it was super close to the BART and within a short walking distance of two of the three Ex Postal Facto event locations. 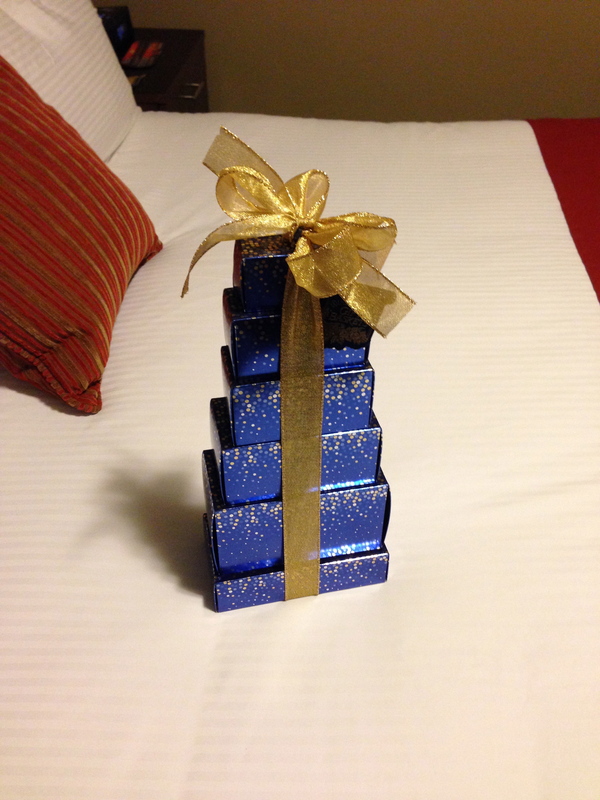 We got a really good rate, which made me nervous…inexpensive hotels in expensive cities can be scary places. Thankfully, the Abri was fantastic…the staff were all kind and helpful, the room was clean and modern (there was a super-large TV on the wall, perfect for middle-of-the-night viewings of the Olympics!) 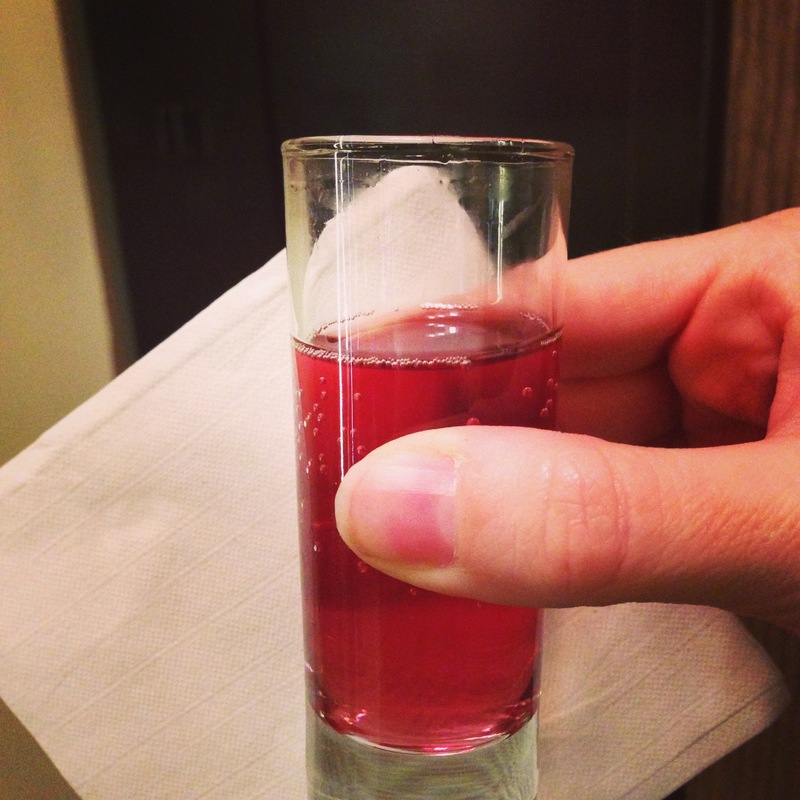 and they served little juice shots in the lobby every afternoon. 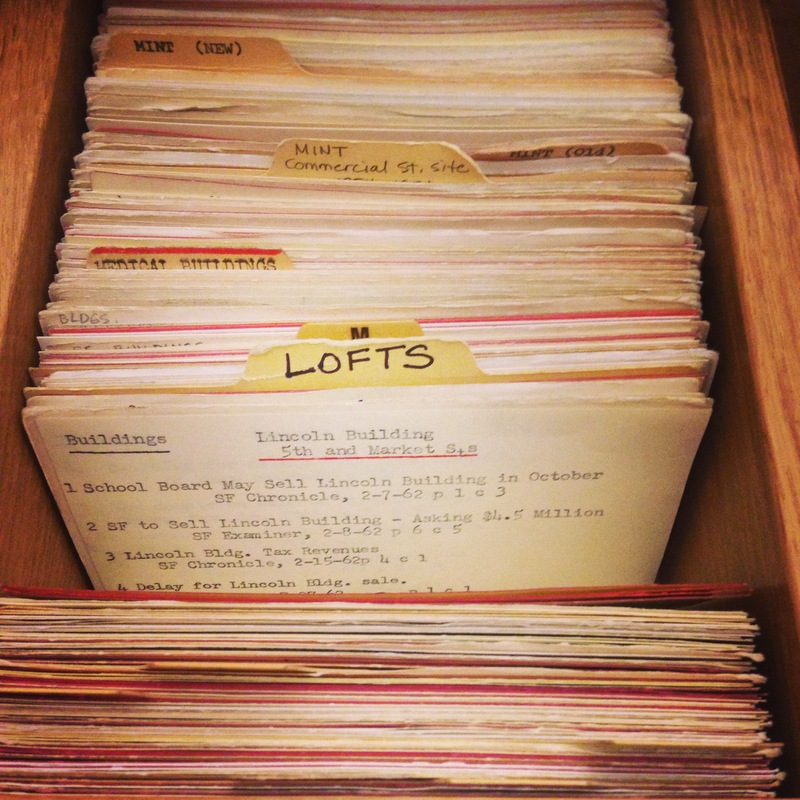 When I checked in, they offered me the choice between an interior room or an exterior room. Of course, I wanted the street-side! (I’m no stranger to noise!) 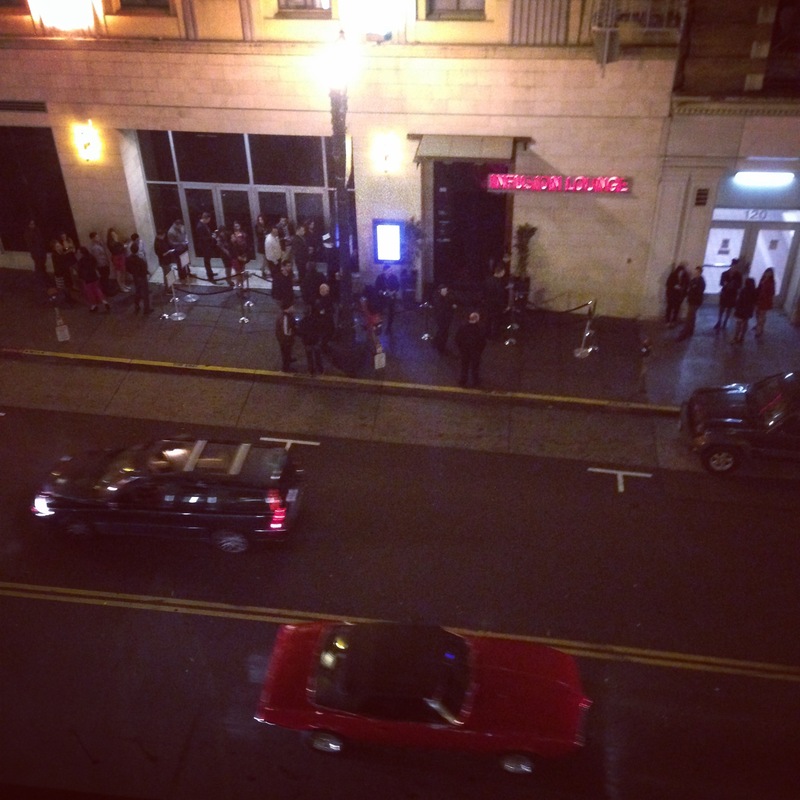 It turns out, the nightclub across from the hotel was JUST below my window (pictured above, velvet ropes and all). On Friday night when I got home, I had to laugh at all of the commotion, but it didn’t really bother me…the club music became white noise and I was up watching the Olympics anyway. All of my food and drink stories made Naoto wish he had joined me. I think if Ex Postal Facto become a recurring thing, he won’t be staying home for the next trip! I make it a rule to never complain about snow until March. I mean, it’s only fair…winter begins in December and ends in March. It’s only sensible to expect it to snow once or twice (or a million times) in those months. 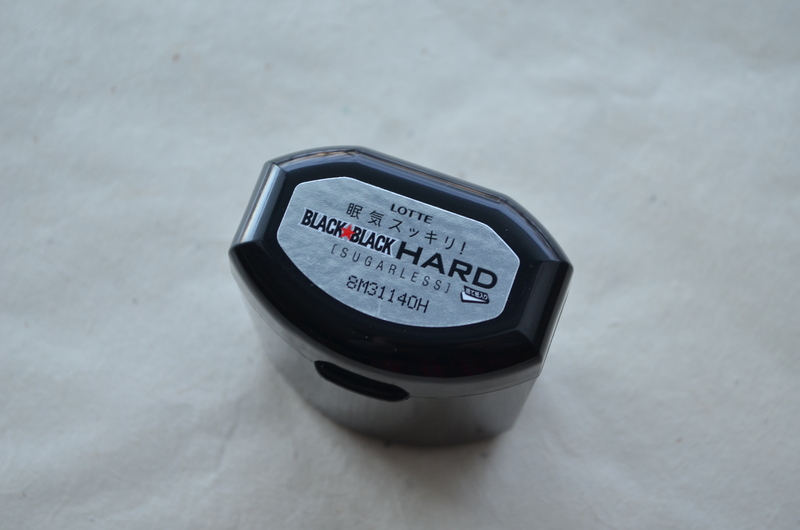 Naoto and I are lucky that we can walk just about anywhere to get what we need. I’m sure if we were forced to drive on slick and snowy streets, I would feel a little bit more resentful of the weather…but for now, I’m accepting of the fact that I live in the Midwest and we get the best and worst of the four seasons. I haven’t left the apartment since Sunday afternoon…we bought a ton of groceries and prepared to hunker down at home. But last night, I was feeling a little bit stir crazy. And then I got a serious craving for a vanilla steamer. Starbucks is only two blocks away, but I thought it was rather silly to risk the tip of my nose for a drink. Plus, the steamer wouldn’t be steamy for long in sub-zero temperatures. And then I remembered that someone had given me a recipe for steamers at home…and we happened to have all of the ingredients on hand. It was meant to be. Stay warm this week, everyone! 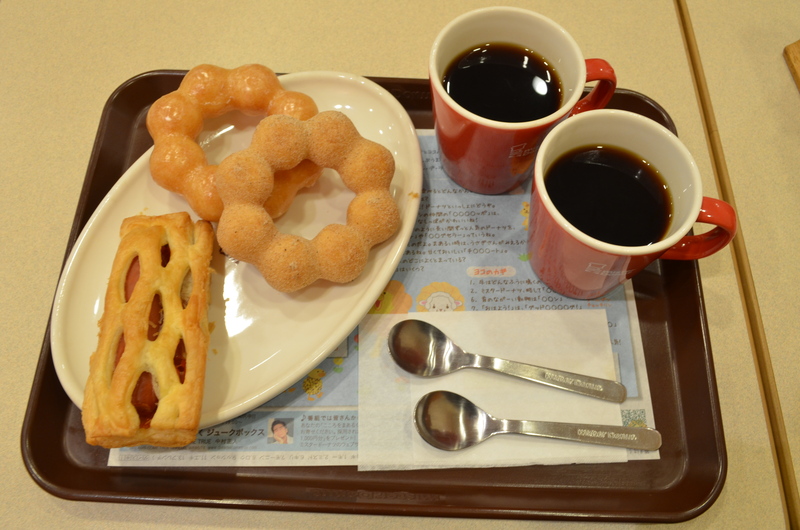 I don’t know where Mister Donut gets its music. Some days it was this “Misdo Club” radio station (the announcer spoke in English and it played mostly American music) and other days it was a little bit more random. No matter which format was playing, we sat there for an hour or so every single morning and the song above played at least four times. I was the first to notice it. Then Naoto noticed and every time the song came on we would laugh. No one else in the restaurant seemed to notice at any point. It became weird, but very catchy. It’s kind of an ear worm. I have no idea what she’s saying, or how to say what she’s saying, and I find myself singing along. When we got home and Naoto found the video, it was exactly how I pictured it. 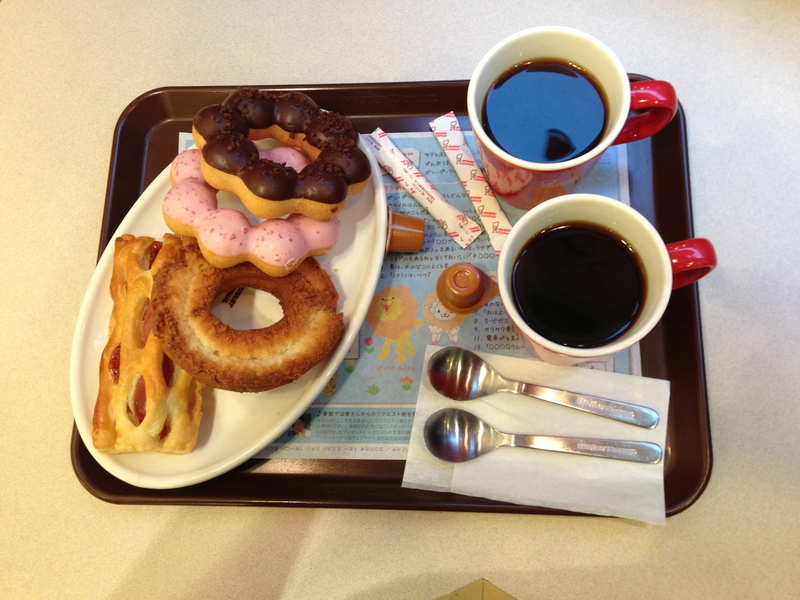 Upon further research, Naoto learned the song was written for Mister Donut…if you go to iTunes Japan site, you can see the donut on the album. Sadly, I haven’t found it on the American iTunes site…so I guess I’ll just have to watch the YouTube video over and over and over again to relive my Misdo mornings! 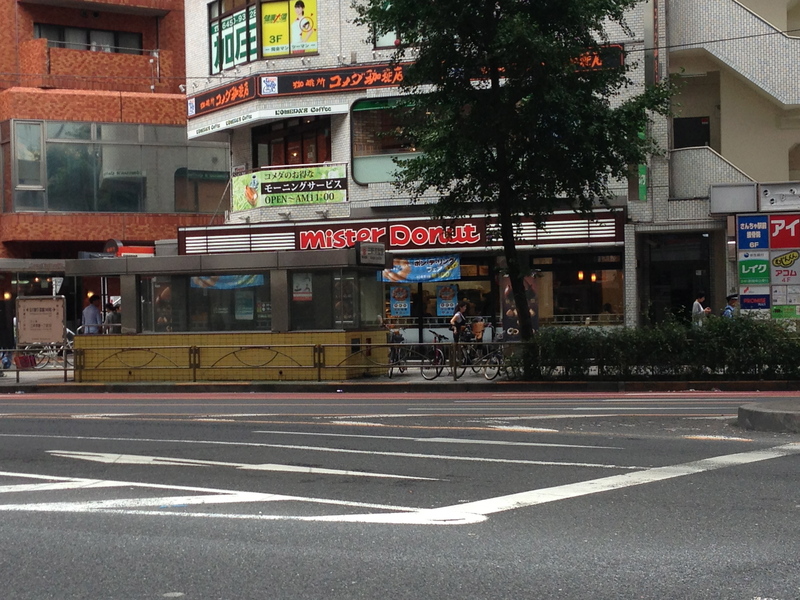 If there is one thing in Japan that I miss most, it’s Mister Donut. 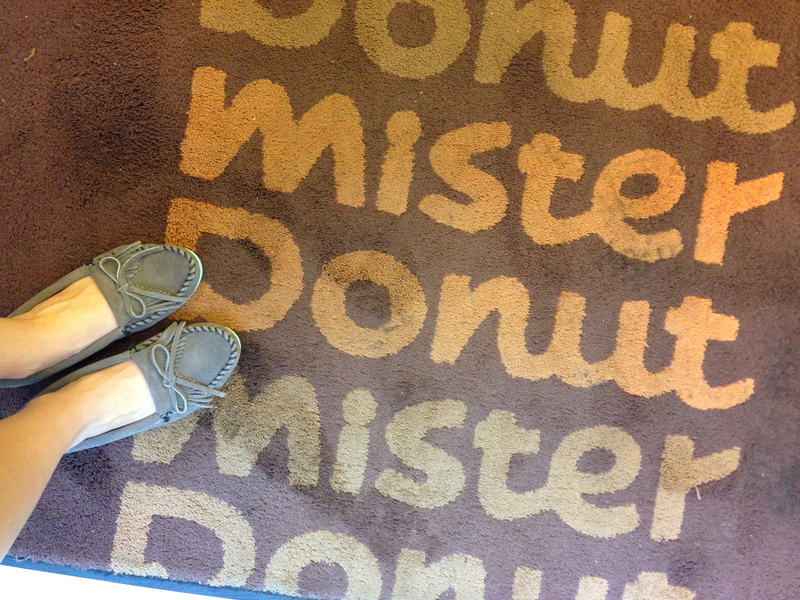 More than amazing office supplies, more than fancy stationery, more than MT tape…I miss Misdo (affectionate for Mister Donut). In normal, everyday life, I think donuts are fine. 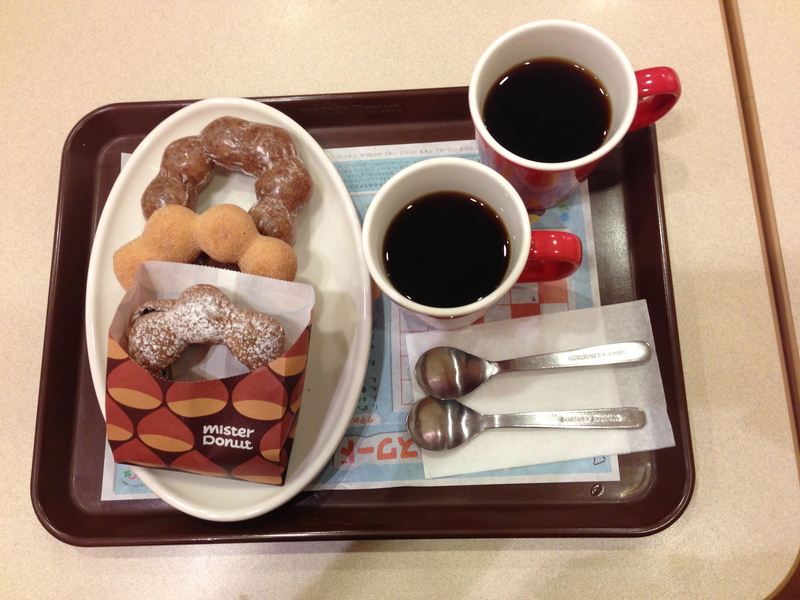 Naoto and I go to Dunkin Donuts almost every day for the coffee. Sometimes I might get a donut, but it’s really just to quash a morning sugar craving (or make the sugar craving last all day, as the case may be). Dunkin Donuts donuts are not really delicious to me. 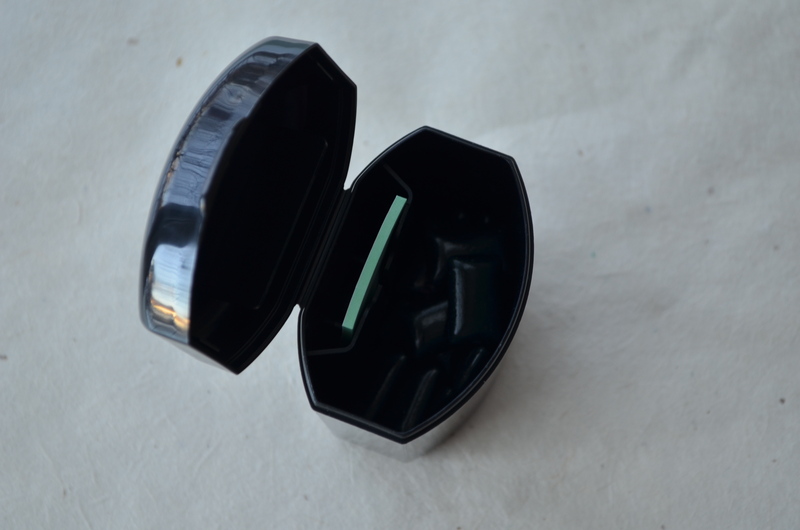 (No offense Dunk…but you guys truck them in…how can you even think that’s a good idea?) 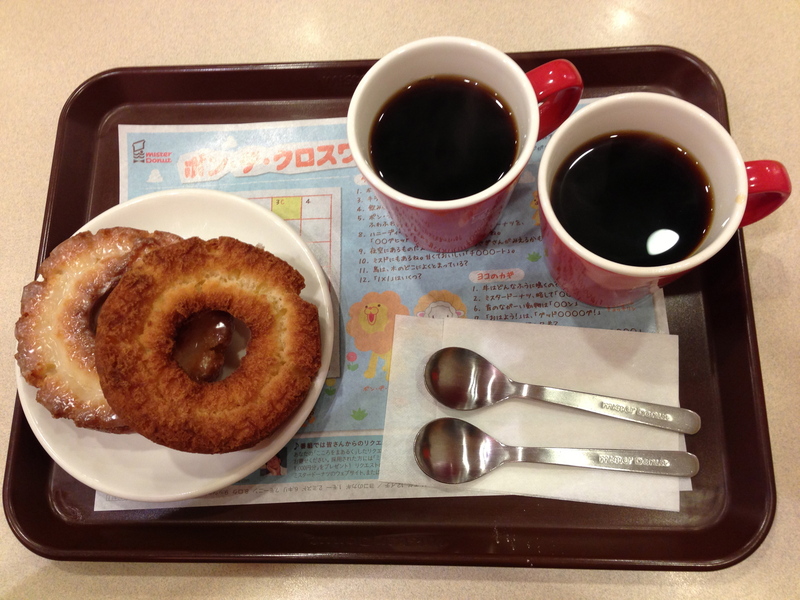 But at Mister Donut, donuts are a must. They taste different than American ones. First of all, they are made fresh on the premises. 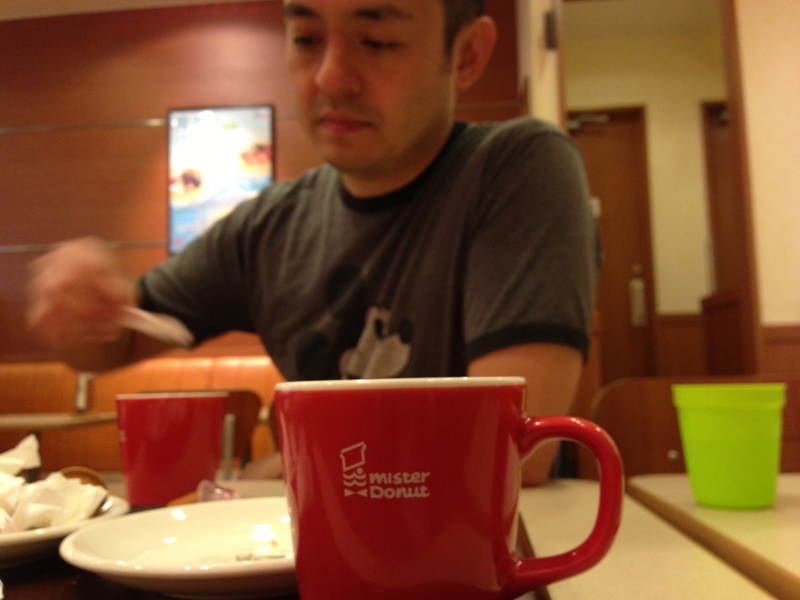 Naoto and I went to the Mister Donut right at opening on our first day in Japan (hello, jet lag!) and they were filling the shelves for the whole first hour with fresh-from-the-oven delights. Aside from the freshness, the donuts are just…different. They are lighter, less sweet and have a better consistency than American donuts (bakery & Dunkin). I seriously have never had a better donut. They also have different flavors than typical American donuts. 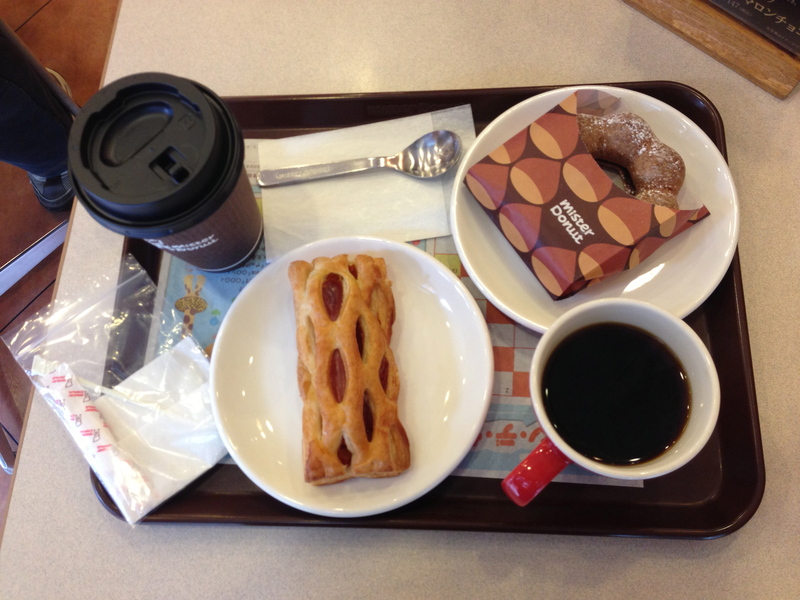 Misdo’s glazed donut is glazed with honey (not corn syrup), there is a green tea old fashioned, there are savory donuts made with puff pastry filled with a hot dog or au gratin potatoes… And, Mister Donut has new flavors that they roll out with the changing seasons. 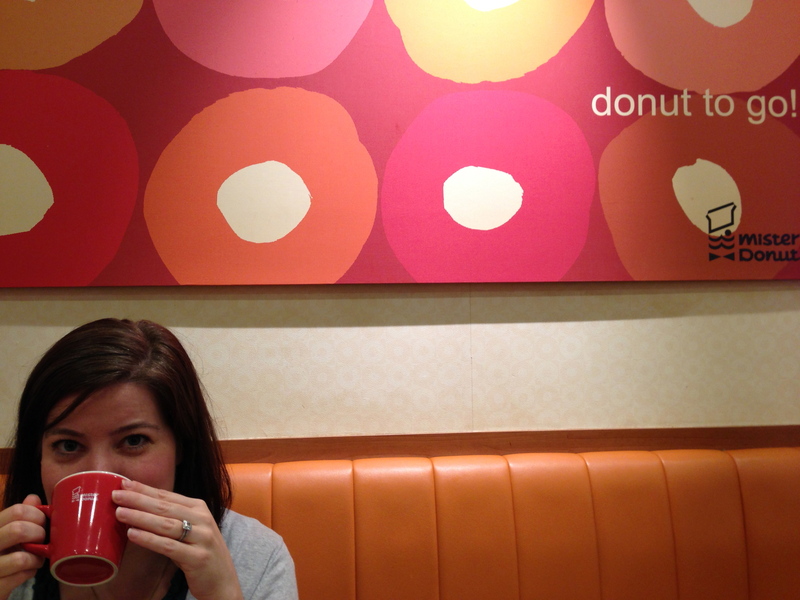 When we there there in 2011, I gorged myself on a variety of sakura (cherry blossom) donuts. 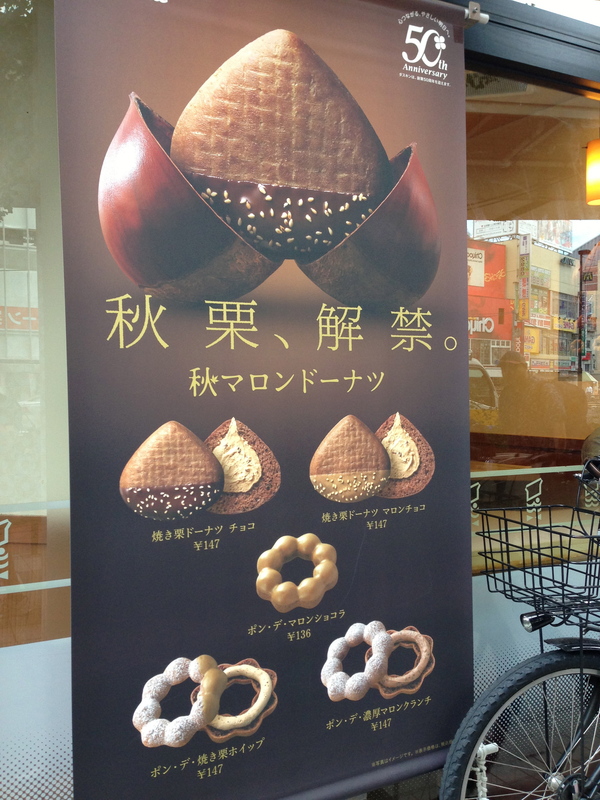 This time the new flavor for fall was chestnut. Those were all amazing. Would you like to see every single donut I ate on my vacation? 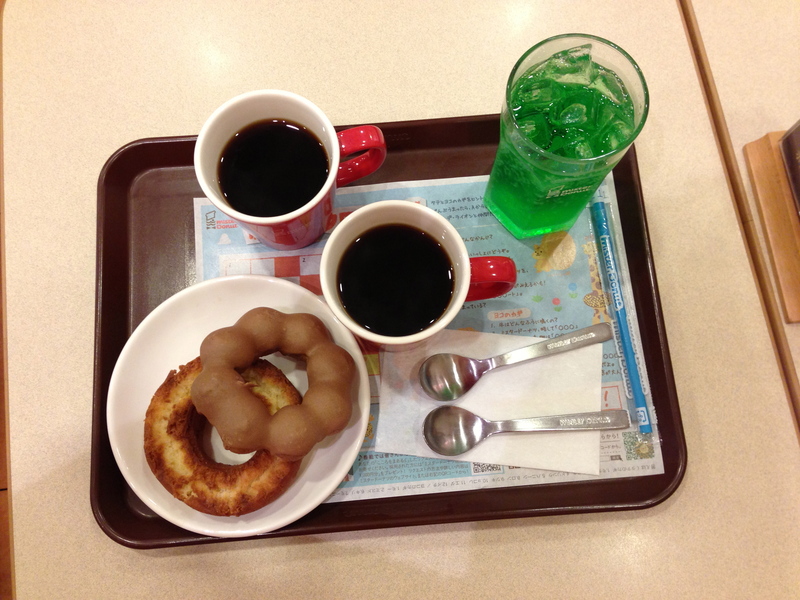 Keep in mind, I shared those donuts with Naoto…I didn’t eat all of them on my own. We had fun each morning choosing the next one to try, or going back for old favorites like the hot dog. I cannot tell you which is my favorite. It changed by the day. You just really can’t go wrong with Misdo. 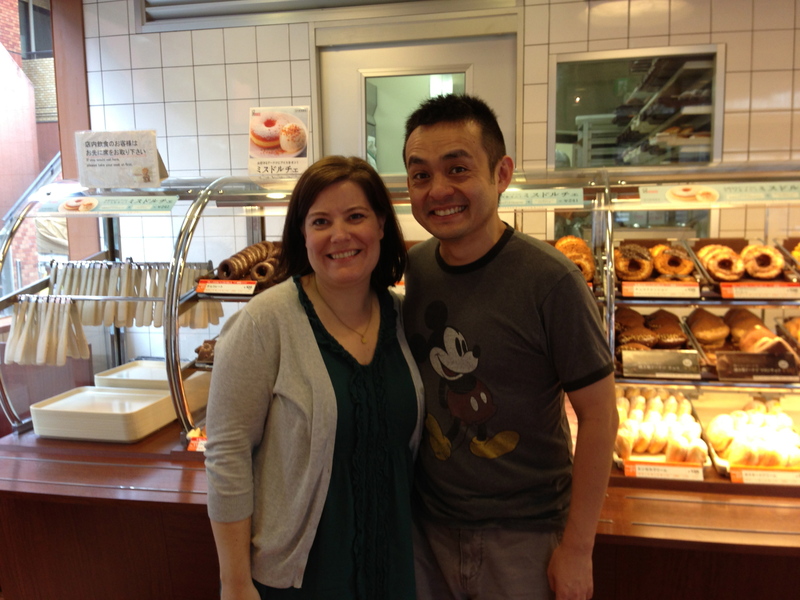 In “our” Mister Donut (the one by the hotel…hey, we were “regulars”! 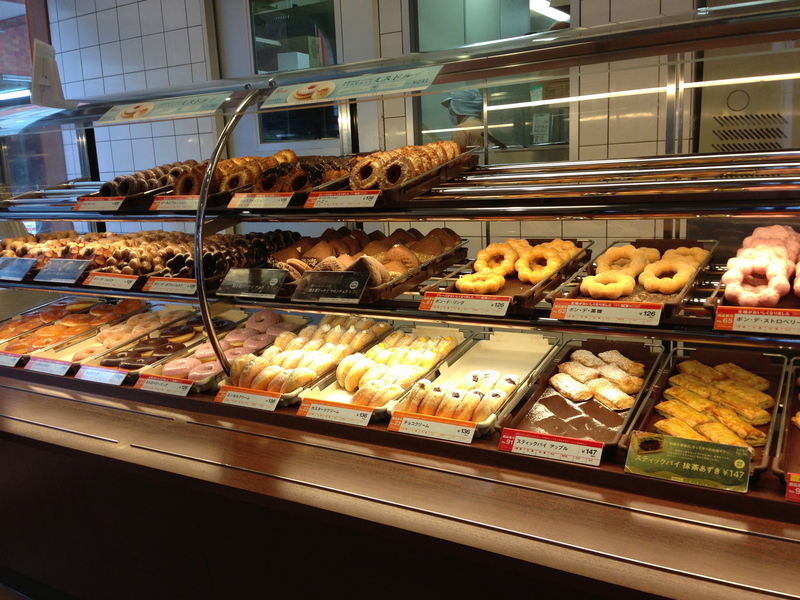 ), you walk in and pick up a little tray and tongs and choose your own donuts. 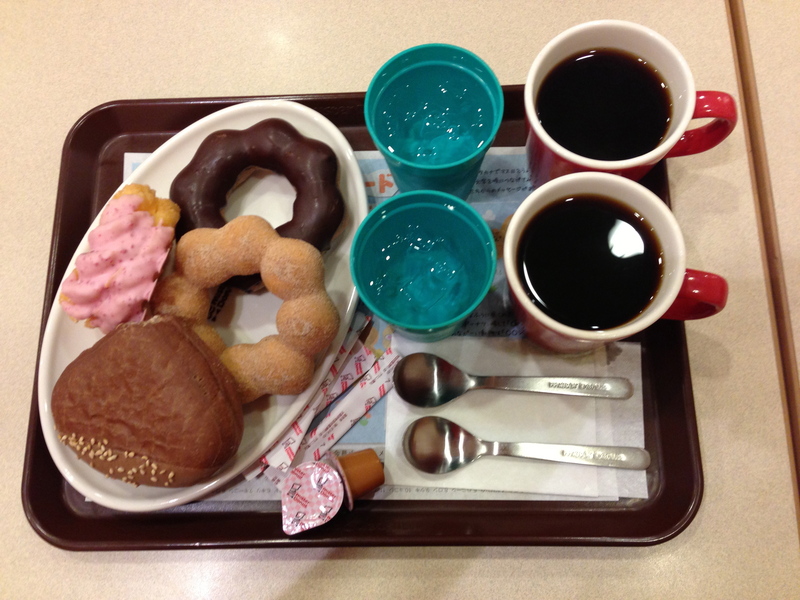 At the cash register, the staff transfers your donuts to a plate (and warms up your hot dog donut if you wish) and places the plate on another tray with your coffee. Then you can take your tray to your seat at a table or a counter by the window. 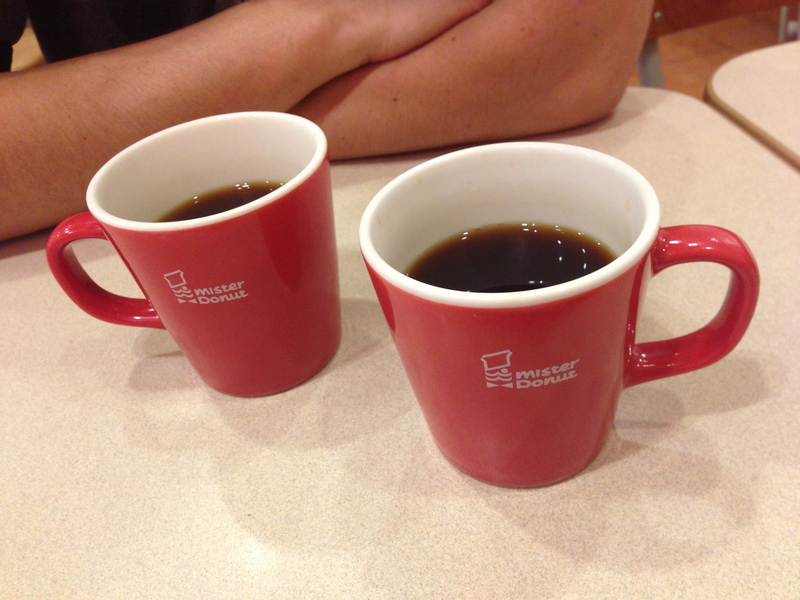 When you sit in the restaurant, your little red Misdo cup is a bottomless cup of coffee. The Misdo staff comes around and pours refills periodically, carrying a little basket with creamers and sugars. Naoto and I drank a lot of refills, especially because we were up so early and had a lot of time to kill before places opened at eleven.